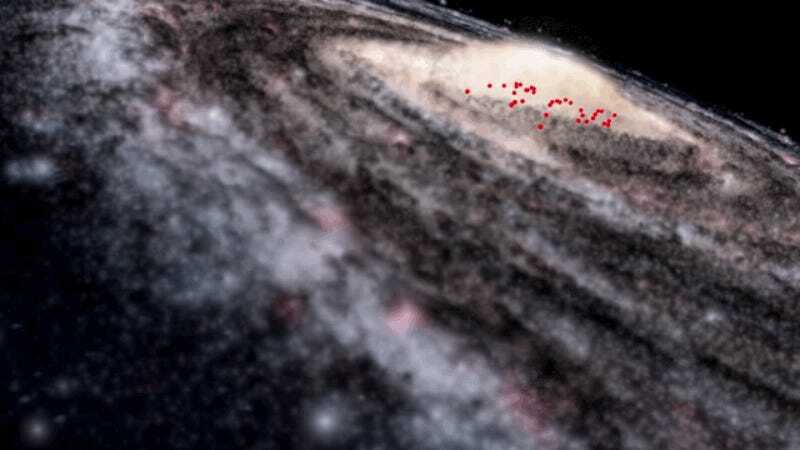 Using the VISTA telescope, astronomers in Chile have discovered a previously undetected band of young stars hidden away behind thick clouds of dust in the central bulge of the Milky Way. Sometimes observation leads to some unforeseen discoveries, as in the case of this study. Our Solar System is parked inside the Milky Way, which presents a challenge for astronomers trying to study its physical details. We’re stuck on the inside of an object that stretches for 100,000 light-years and is filled will some 100 billion stars. What’s more, there are parts of the Milky Way, like the galactic bulge, that are obscured by massive plumes of dust, making observations even more difficult. This is where the VISTA telescope at the Parnal Observatory in Chile can help. It was designed to study the Milky Way’s more elusive and distant features by snapping wide-field, high-resolution images at infrared wavelengths. By using this tool, a research team led by Istvan Dékány of the Pontificia Universidad Católica de Chile was able to discover a component of our galaxy that had never been seen before. Using data pulled in by the Vista Variables in the Vía Láctea Survey (VVV) from 2010 to 2014, the astronomers found 655 candidate variable stars of a type called Cepheids. These stars are unique in that they expand and contract at regular intervals. Their brightness can change dramatically in just a few days or months. Cepheids come in two classes, one much younger than the other. Of the 655 discovered, the astronomers identified 35 belonging to a sub-group of young bright stars known as classical Cepheids. These objects are qualitatively different than their older counterparts found in the central bulge of the Milky Way. This would imply that there’s a previously unconfirmed, continuous supply of newly formed stars in the central region of the Milky Way. What’s more, by mapping these Classical Cepheids, the team highlighted an entirely new feature of our galaxy: a thin disc of young stars that stretch across the galactic bulge. Future investigations will seek to determine whether these Cepheids were born close to their current location, or whether they migrated inwards.